Google Search is a powerful search engine and it doesn’t hurt to emphasize the data because the brand is going way beyond simple search results. They have now introduced a new feature which allows you to find the best hotel deals by browsing through map and book flight tickets directly. While it is known that Google is definitely not going to start any new localized or country based services for booking, the brand definitely wants people to stay in their search ecosystem longer without moving to third-party apps. Every time you search for hotels in a new city or in your own locality, Google will automatically suggest the list of available hotels in your locality. The hotel search is fully customizable as you can choose to filter accommodation based on pricing, list of amenities provided, its proximity to the airport and so on. Most users would usually book hotels using third-party websites and apps to make bookings. With Google’s newest update to their search results, it is geared towards providing more localized and easy to find hotels. You can choose to find all available hotels in a destination, their pricing and room availability before making a reservation. Based on the feature, it is assumed that users might be redirected to the hotel’s booking page in order to complete the transaction and they might also be encouraged to provide the best discounts so as to attract visitors directly than through comparison websites. 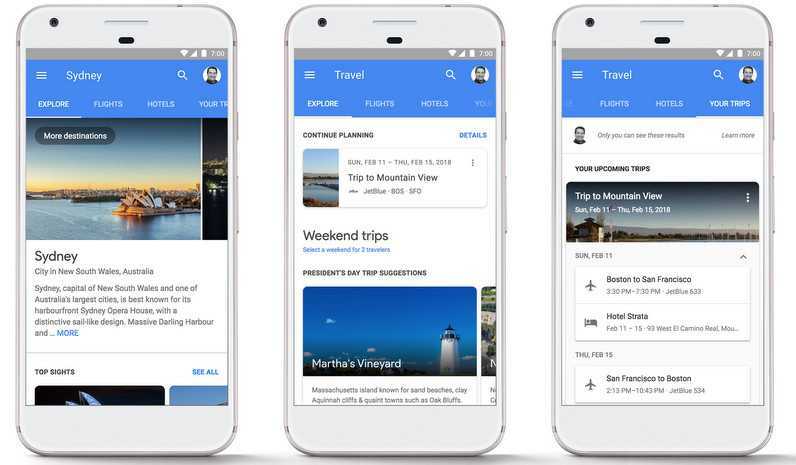 Google Flights now provides all the information you need to know about a flight, timings, pricing and any discounts that are available. The search feature will be linked with results that are usually displayed every time you search for a new location, things to do. The new ‘More Destinations’ tab which is now found in the mobile version allowing you to see weekend getaways, close by locations and other relevant info. The mobile version of Google search results should offer an improved experience with ‘Your Trips’ column. The tab retrieves information from Gmail to list all the travels that you completed in the past, your scheduled trips and you can also choose to send the information to friends or family when needed. The Your Trips part of the app can be easily accessed offline and the information stored in it can be shared with anyone including travel agencies who can provide you with the necessary guidance when you need valuable suggestions on things to do in a travel destination.